Brad Boxberger went 4-4 with a 3.38 ERA (29.1-IP, 11-ER) and 40 strikeouts in 30 appearances last season for the Tampa Bay Rays. ST. PETERSBURG, Fla. — The Tampa Bay Rays have traded right-handed pitcher Brad Boxberger to the Arizona Diamondbacks in exchange for minor league right-handed pitcher Curtis Taylor. 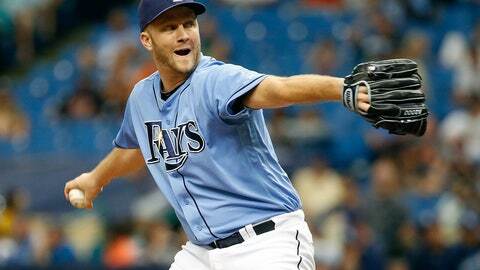 Boxberger, 29, went 4-4 with a 3.38 ERA (29.1-IP, 11-ER) and 40 strikeouts in 30 appearances last season for the Rays. His four wins ranked second among Rays relievers despite missing the first 80 games of the season with a right flexor strain, the second consecutive year he missed significant time due to injury. He recorded a 0.96 ERA (9.1-IP, 1-ER) over his final nine appearances, lowering his season ERA from 4.50 to 3.38. In 2015, his second season with the Rays and first full year in the majors, he was named to his first All-Star Team and led the American League with 41 saves. Over parts of six seasons in the majors with the San Diego Padres (2012-13) and Rays (2014-17), he is 17-20 with a 3.19 ERA (231-IP, 82-ER) and 297 strikeouts. Taylor, 22, went 3-4 with a 3.32 ERA (62.1-IP, 23-ER) and 68 strikeouts in 13 appearances, all starts, last season for Class-A Kane County. He did not pitch after July 13 due to a right shoulder impingement, but is expected to be healthy to begin the 2018 season. Following the season, he was ranked by MLB.com as the No. 14 prospect in the Diamondbacks system. The 6’6” righthander was a fourth-round selection of the D-backs in the 2016 June Draft, becoming the highest-drafted player from the University of British Columbia since left-handed pitcher Jeff Francis in 2002. He made 17 relief appearances with Short-A Hillsboro in 2016, going 1-0 with a 2.20 ERA (16.1-IP, 4-ER) and 23 strikeouts. In two minor league seasons, he is 4-4 with a 3.09 ERA (78.2-IP, 27-ER), 1.22 WHIP, .231 opponents’ batting average and 10.41 SO/9 IP ratio.